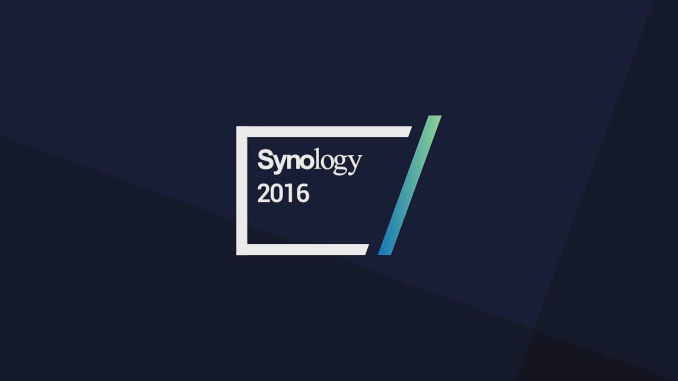 We had the opportunity to attend the Synology 2016 Conference in San Francisco last month. The event gave us quite a bit of insight into what Synology has lined up for the market over the next 6 months or so. The conference dealt with three main topics - Synology NAS units in a business environment, multimedia aspects for home consumers and backup / disaster recovery solutions enabled by the DiskStation Manager (DSM) OS. Synology also took the opportunity to launch the long-term beta for DSM 6.0 and gave us a sneak peek at the new hardware in store for the next couple of quarters. 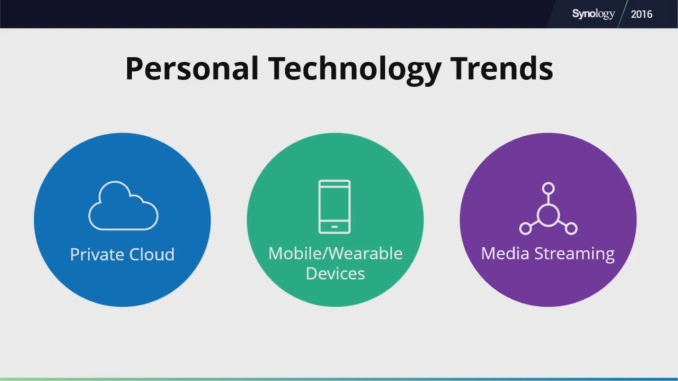 A few slides from the presentations at the conference are reproduced below along with our comments on how the proposed features fare against what the competition has to offer in this market segment. It is a well known fact that the NAS market is experiencing rapid growth, particularly over the last few years. That said, it is difficult to get a breakdown of the number of NAS units sold by each vendor. To our surprise, Synology made it public that they have more than 3.2 million NAS units in the field. Obviously, this is the number of units sold since the first Synology NAS - the DS-101 - was introduced into the market in March 2004. Synology has slowly moved up the ladder in terms of market appeal. While the initial units targeted home consumers, SOHOs and SMBs, some of the current products even cater to the SMEs (small and medium enterprises). The evolution of the Synology OS - the DiskStation Manger (DSM) - has been dictated by two separate aspects - business trends including virtualization, cloud access and an emphasis on data protection, and home consumer trends including the 'private cloud' concept, ease of access from mobile and wearable devices and an emphasis on consumption of stored multimedia content. 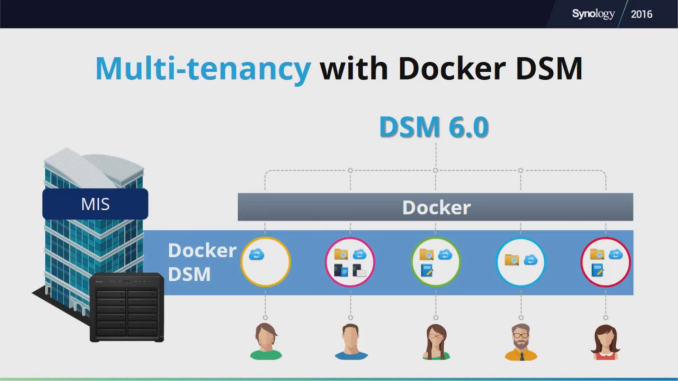 Synology talked about a new beta program for the DSM 6.0 release. 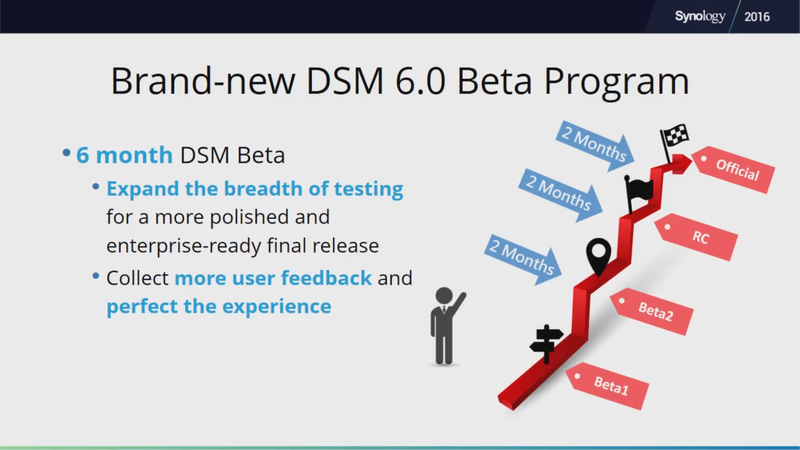 Slated to go live in a few weeks, the new DSM 6.0 beta program will last for approximately six months - allowing for a couple of betas and a release candidate version before the official release. This program is similar to the one adopted by QNAP with great success for QTS 4.2. As of today, QNAP's QTS 4.2 is in RC5 status, and we have seen user feedback being take care of with each successive release. The long beta cycle will definitely help Synology in improving the quality of the official DSM 6.0 release. Last year, Synology was in the news due to the SynoLocker ransomware. It created a lot of bad publicity, but it also made Synology look into security issues proactively. Towards this, DSM 6.0 will be subject to the QualysGuard security and compliance suite in order to continuously monitor each release for vulnerabilities. 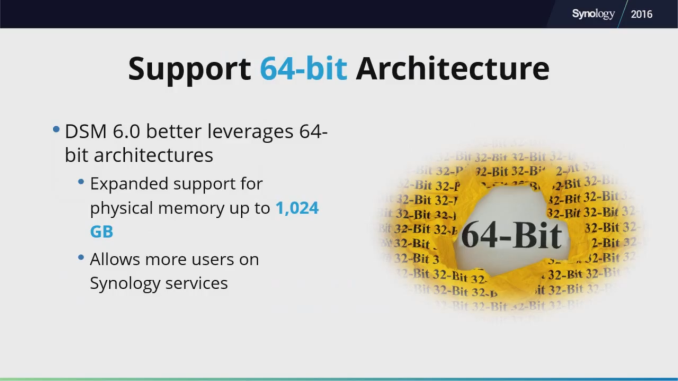 Synology is also improving 64-bit support in DSM. Even though the core DSM has been 64-bit capable for quite some time, the add-on packages have never been able to take advantage of the 64-bit architecture (being limited to 4GB of RAM). DSM 6.0 will remove that bottleneck for the add-on packages as well as apps. Synology launched the RC18015xs+ with btrfs support back in June 2015. DSM 6.0 expands this support to more models. With these Intel-based NAS units, DSM will present an option for the file system (EXT4 or btrfs) when configuring a volume. Users will get the full set of benefits from btrfs - data checksumming and snapshots included, with flexible restore options. Compression is also supported, with claims of up to 30% storage savings in use-cases where the majority of the content is source code / text. DSM 6.0 will also expand SSD caching support. I/O performance in mixed HDD / SSD environments can be maximized using up to 12 caching SSDs. This aspect deserves more investigation, particularly when compared against QNAP's Qtier auto-tiering technology. DSM 6.0 will also enable Synology NAS units to act as network security appliances. 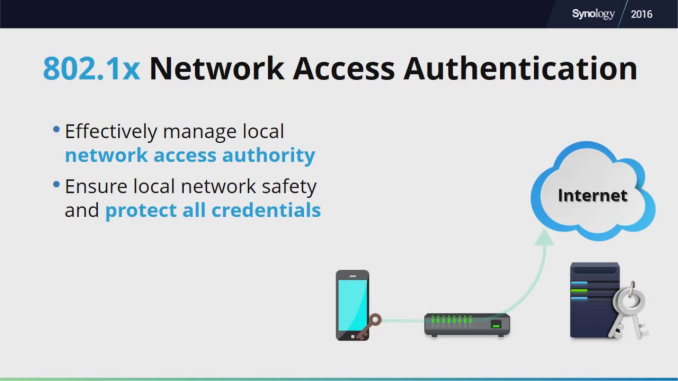 Support for 802.1x network access authentication will be expanding the capabilities of the NAS units. The NAS units can act either in detection mode (IDS) to monitor network packets and provide logs for future evaluation or in prevention mode (IPS) as an in-line system that can drop questionable packets in transmission. 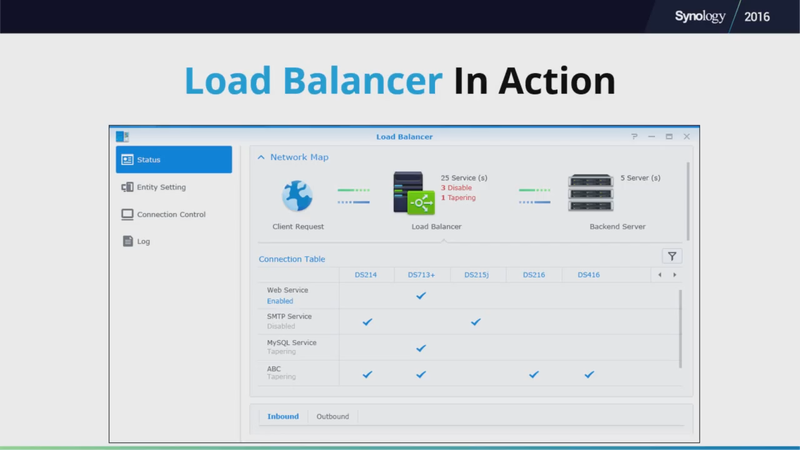 DSM 6.0 will also have a load balance feature. This service can help redirect client requests to the appropriate servers in order to maximize overall throughput. Synology is also introducing a new mail server (similar to Microsoft Exchange Server) component. 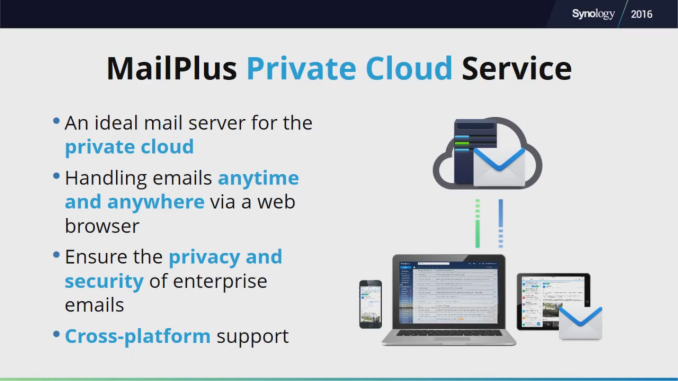 The MailPlus Private Cloud service mainly targets enterprise users. It includes features for service continuity and load balancing to help with high availability. 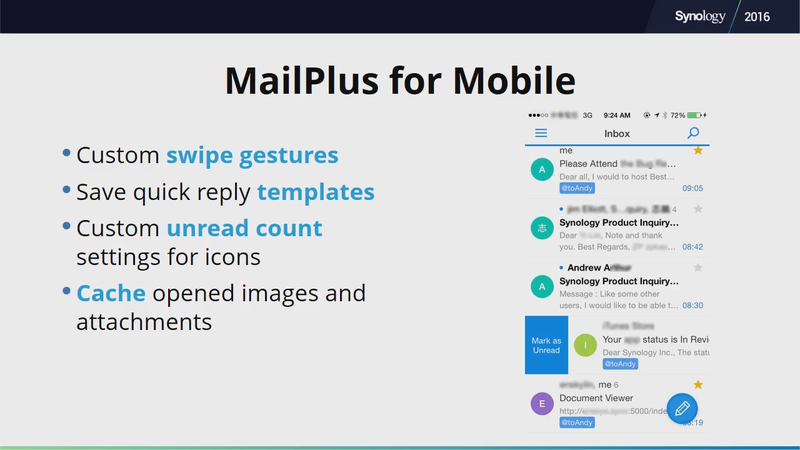 Spam filtering is also available. 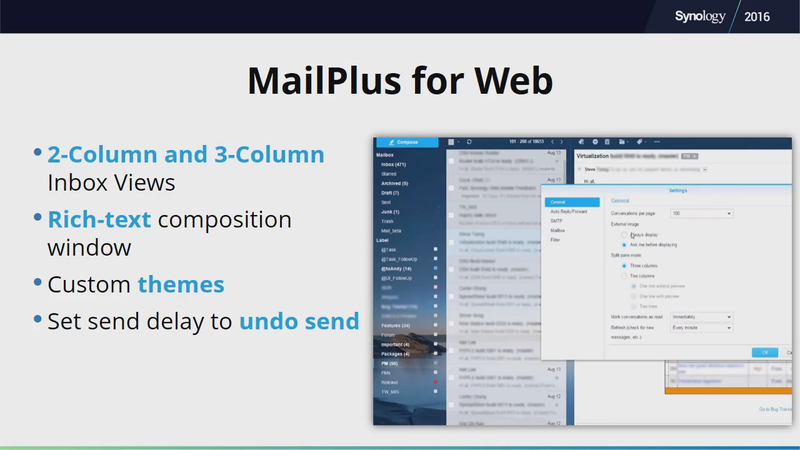 The MailPlus server can be accessed by users via the web or via mobile apps. 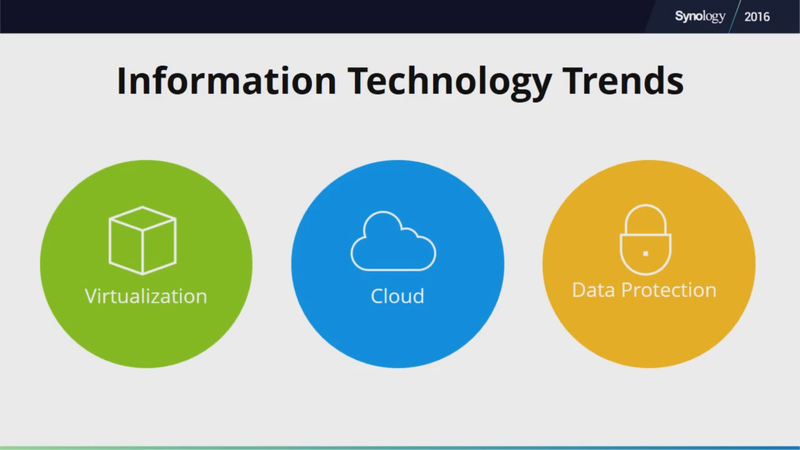 Virtualization is one of the hot topics in the industry right now. In particular, container-based virtualization technologies like Docker have taken off rapidly in the last couple of years. Unlike vendors such as QNAP who provide support for both container-based virtualization using Docker and the standard virtualization scheme using QEMU, Synology is betting big on Docker alone. DSM 6.0 brings about the ability to run DSM itself in a container. This allows a single NAS unit to be able to actually run different versions of DSM at the same time. The advantage of this for enterprise users is live migration without service interruption and cluster expansion based on demand. 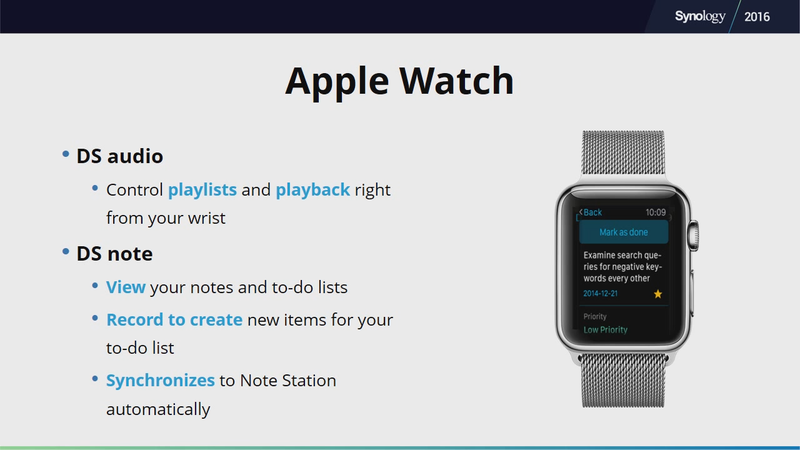 Moving on to the wearables side, Synology is also coming out with a couple of apps for the Apple Watch. The DS audio and DS note apps allow for interaction with the NAS (in terms of contents such as audio playlists and notes that usually need access from wearable devices). Other interesting updates in DSM 6.0 include a new Spreadsheet package which appears to be a private cloud cut-down version of Google Sheets. 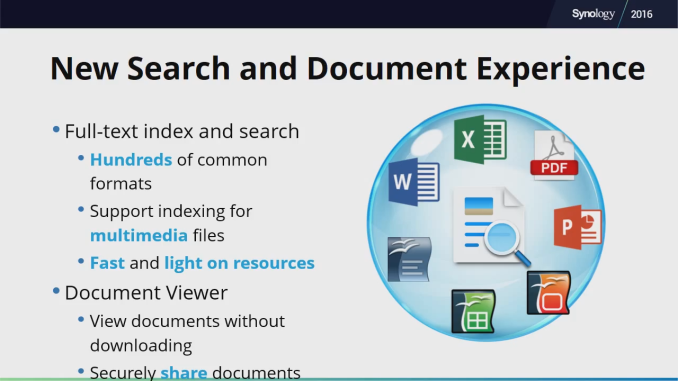 DSM 6.0 also includes better search capabilities. Synology didn't go too much into the details, but it appears to go head-to-head with QNAP's Qsirch feature. The Note Station package in DSM 6.0 also receives some updates with features such as offline mode. Moving on to the multimedia packages, the new Video Station will have an offline transcoding feature in addition to the existing real-time transcoding. This feature has been around in both Asustor and QNAP NAS units for quite some time now. 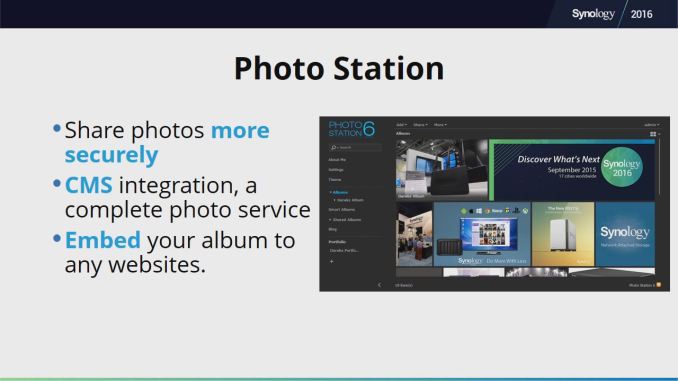 The interfaces for Video Station and Photo Station will also be receiving updates. The complementary DS Video and DS Photo apps will also be getting Windows 10 versions soon. Synology also talked about their Cloud Station suite for backup and disaster recover. 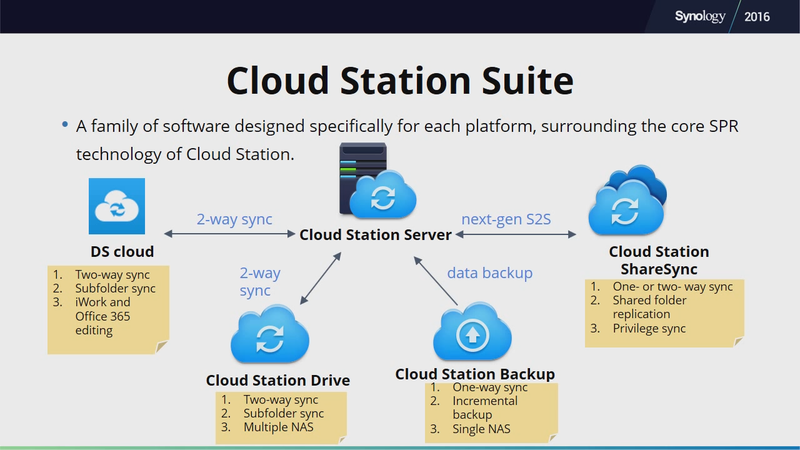 The suite brings together a number of disparate packages that have been in place to provide backup and sync capabilities to Synology users. 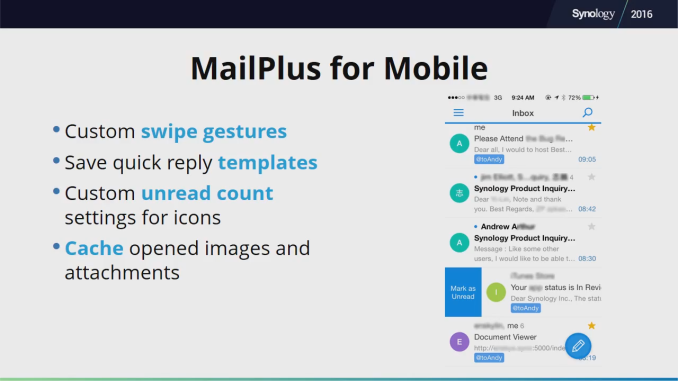 The previous set of apps presented a disjoint (and sometimes, confusing) picture to end-users. Consolidating them under one umbrella is definitely good news for Synology users. Cloud Station Drive (the new name for the Cloud Station PC client) can now sync multiple PC folders on to one shared folder. In the same way, a particular folder inside a shared folder can also be selectively synced on to a PC. Synology is also implementing an 'Intelliversioning' algorithm for versioning purposes - choosing the right version to rotate instead of using a simple FIFO model. DSM 6.0 also simplifies backup and restore while maximizing efficiency using both block-level and cross-version deduplication. Backup Explorer will also be integrated within the DSM File Station feature. Off-site backups are also simplified with export and relink capabilities making it unnecessary to transfer large volumes of data over a network connection. Disaster recovery features are also available. 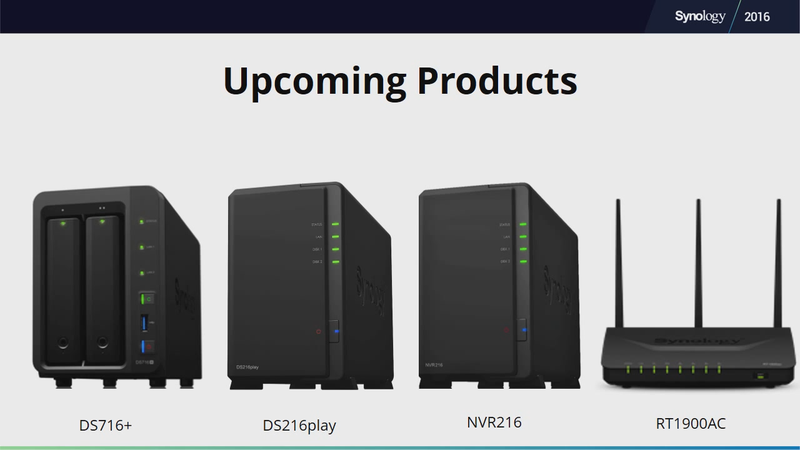 Synology also took the opportunity to launch a set of new products. The DS716+ 2-bay NAS unit (expandable to 7 bays) will sport a Braswell SoC (Celeron N3050) and support hardware-accelerated encryption capabilities. 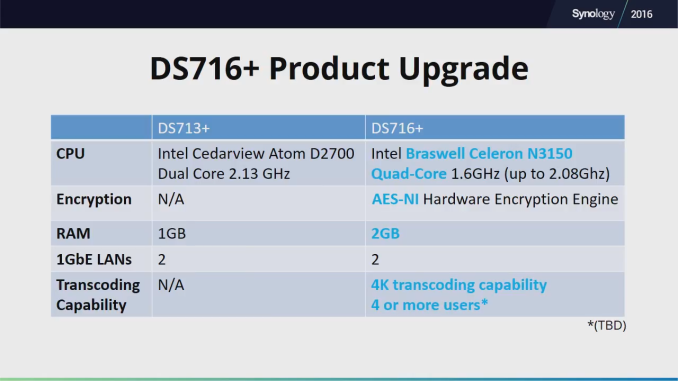 This is an update to the Atom D2700-based DS713+. The DS716+ supposedly provides 4K transcoding capability - it is not clear if this is using the Quick Sync engine or via software. 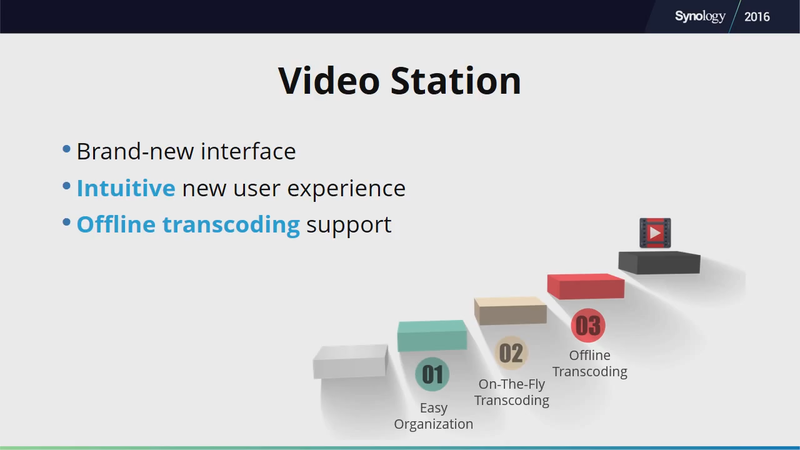 We have already had a look at the DS216play targeting the budget-conscious consumers looking for a transcoding NAS. 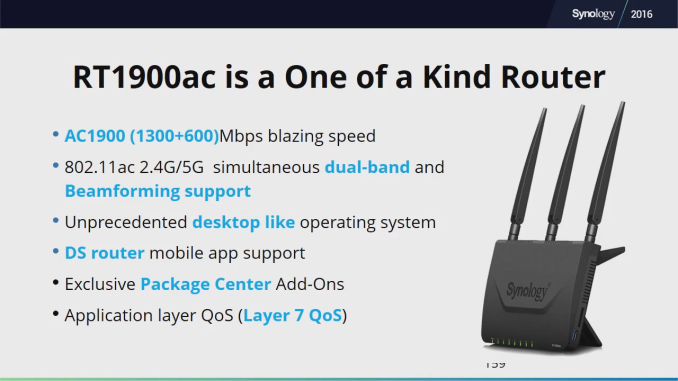 Synology also plans to launch a AC1900 router with an OS based on the DSM. If the DSM UX is carried over to SRM, the traditional router vendors will need to sit up and take notice. Synology claims that their router is the only AC1900-class one with QoS based on the application layer. The mobile apps and package center add-ons for DSM will receive router versions. The NVR216 is a 2-bay NAS with HDMI output capabilities. It supports up to 9 cameras (and comes with a license for 4 cameras). It is expandable via eSATA using a DX213. On the whole, Synology seems to have exciting things planned for the next few months. The features in DSM 6.0 beta target both enterprise and power users with equal focus. The long beta cycle should help in creating a stable official release. The Synology DSM 6.0 beta will be a free download for users who own a DiskStation or RackStation x11 series and onward. Positives aside, we would have definitely been more enthused if Synology had launched NAS units with 4+ bays using the Braswell platform. On the DSM side, in addition to the existing extensive Docker support, it would have also been nice to get support for running full-blown virtual machines. 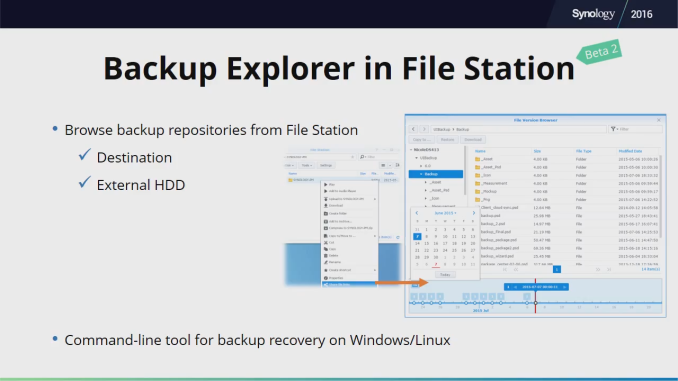 This would allow for running of other operating systems on a Synology NAS (similar to QNAP's Virtualization Station). It is definitely a surprise if Synology doesn't see a demand for this in their target market. I'd like to connect my NAS directly to a TV or a projector with an HDMI cable. Currently to watch a movie I have to download it from my Synology DS212j to my laptop, then connect my laptop to the projector with HDMI. I would gladly upgrade to a new Synology NAS if it had such capability. I am doing something like this and are happy with the solution. I have the DS212j placed central (hidden) in the house on the LAN. In the living room I have a small nice looking LianLi box based on a G2020 CPU connected to my TV with HDMI and a wireless keyboard. All my movies are by the way in H264. Wait, so when you want to watch a movie, you still have to download it from NAS to your small LianLi box, right? If yes, then that's exactly what I want to avoid! I just play the movie file on my PC directly from the DS; I don't download it onto the PC. Works even for BluRay rips. I'm using a DS410 but the DS212J should easily be able to send the data to the PC fast enough. If it can't then you probably need to have a look at that, e.g. make sure you're using Gigabit and have Jumbo Frames enabled. Your NAS sits on your network somewhere in your house (mine is in my utility closet). On it, you setup simple shares for your different file types such as videos, photos, documents, etc (either using windows friendly SMB or something like NFS, FTP, etc depending on your preferences and needs). Then on your cheapie head unit (nexus player for $50, etc) you install Kodi or what used to be XBMC. 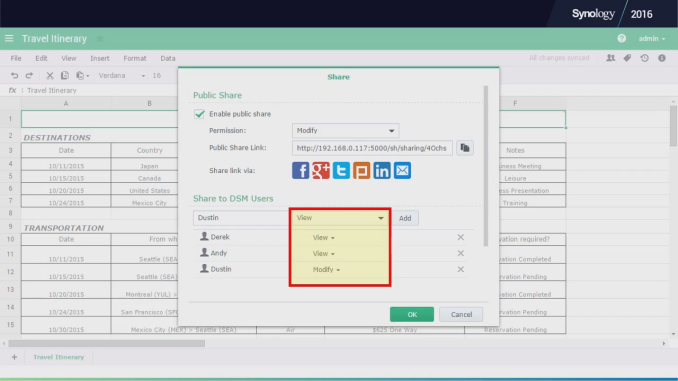 It can acess and scan windows shares, NFS, FTP or many other types of shares and index the media on your NAS. In its very beautiful and feature rich interface, you simply select a movie, tv show, photos, etc and start streaming from your NAS. No downloading required. 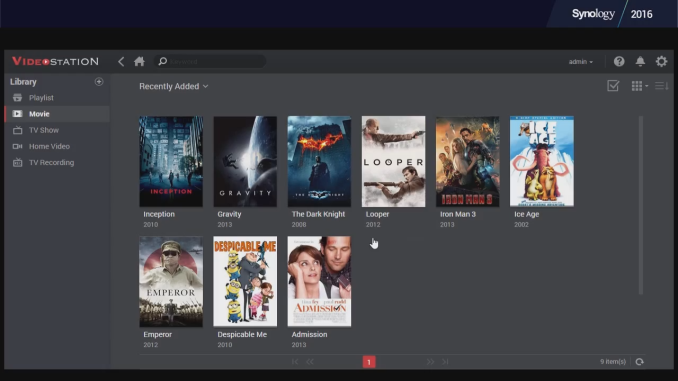 You can even setup a shared Kodi index right on the NAS that all Kodi installs throughout your home can access so they all keep track of your media, whats been watched, where any program is paused, etc. No download to the LianLi. I play the file from the NAS direct.